With the markets closed to celebrate the New Year on Tuesday Wall Street kicked off the first week of 2019 on a higher note. A strong jobs report and soothing commentary from Fed Chair Jerome Powell helped press pause for now on global growth concerns and whatever else seemed to be bothering investors. For the week the S&P 500 gained 1.86%, the Dow Jones Industrial Average gained 1.61%, the Nasdaq Composite gained 2.34%, and the Russell 2000 gained 3.20%. The week started off well with the markets rallying almost 1% on Monday. Wednesday was a quiet day with the markets basically unchanged. Thursday investors became unhinged and the markets fell roughly 2.5% as a rare revenue cut announcement from Apple and disappointing manufacturing data from the U.S. and China helped exacerbate fears that economic growth might be slowing more quickly than anticipated, which would present a headwind to corporate earnings. 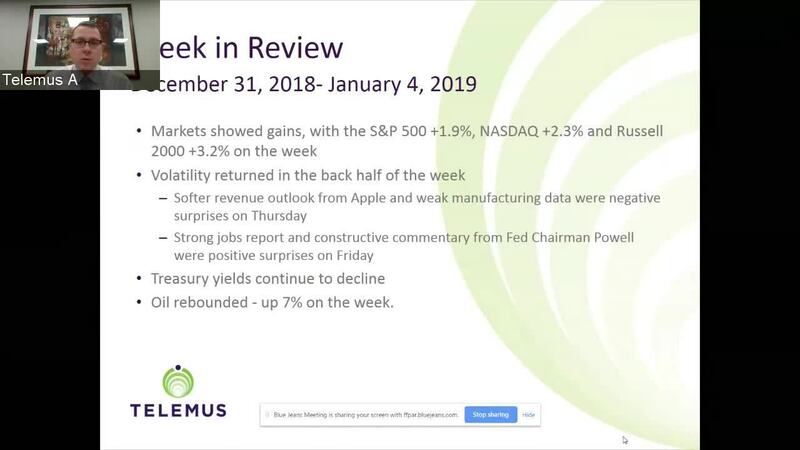 On Friday the markets received two important pieces of news that changed all that – the jobs report and finally some holiday cheer from Fed Chair Powell. On the jobs front the Employment Situation Report for December was comfortably ahead of estimates (+312,000) while average hourly earnings (+0.4%) increased more than expected, lifting the year over year growth rate to 3.2%. However, there were some question about how the central bank would react to the stronger than expected jobs data. Investors quickly got their answer. Also on Friday Fed Chair Powell along with his immediate predecessors, Janet Yellen and Ben Bernanke, spoke in the morning at the American Economic Association's annual meeting in Atlanta. In a wide ranging Q&A session Powell said the Fed will remain patient given muted inflation readings. He added monetary policy will be nimble and shift if necessary, and he also softened his previous comments regarding the Fed's balance sheet reduction path being on autopilot. The markets liked what they heard from Mr. Powell, jumping over 3% on the day, and his comments helped solidify an equity rebound from previous worry over trade tensions and economic growth. The market is not free and clear from economic growth concerns, but with strong U.S. jobs growth and a friendlier sounding Fed, the market could see renewed buying interest. All we need now is the government to reopen and a trade agreement reached with China. U.S. Treasuries underwent wild swings last week amid the fragility in investor sentiment. At the end of the week, the 2 year yield declined four basis points to 2.48%, and the 10 year yield declined eight basis points to 2.66%. The U.S. Dollar Index lost 0.2% to 96.17. In Nymex trading WTI crude rose 7.0% last week to close Friday at $48.31 a barrel helped by easing global growth concerns and rumored production cuts by Saudi Arabia.